Prefabricated steel structure warehouse is a new type of building structure system, which is formed by the main steel framework linking up H-section, Z-section, and U-section steel components, roof and walls using a variety of panels and other components such as windows and doors. Prefabricated steel structure warehouse is widely used in storage, processing, large factories, and so on. I. Wide span: Single span or multiple spans, the max span can be more than 70 meters without middle column. II. Low cost: Unit price range from USD30/sqm to USD80/sqm according to customers' request. III. Fast construction and easy installation. IV. Long using life: Up to 50 years. V. Others : Environmental protection, stable structure, earthquake proofing, water proofing, and energy conserving. Steel is one of the most sustainable construction materials. Its strength and durability coupled with its ability to be recycled, again and again, without ever losing quality, make it truly compatible with long term sustainable development. Construction is quick and simple with the tugela steel portal frame system components. This means high quality results anywhere, using low-cost, low-skilled labour and shorter timeframes. Exceptional resistance to fire, corrosion and pests, portal frame steel buildings are the first choice for extreme environmental conditions. Because steel doesn't need treating with pesticides, preservatives or glues, it's also safer for people handling and living or working around it. Steel portal frame structures last longer, are light and easy to transport and create minimal raw material waste. At the end of its long life, steel can also be fully recycled. Steel structures can be erected quite rapidly. This normally results in quicker economic payoff. Steel can be reused after a structure is disassembled. Steel structures can be built with high-quality workmanship and narrow tolerances. Steel is highly suitable for prefabrication and mass production. Steel structures in general can be repaired quickly and easily. Steel structures have relatively good fatigue strength. We have more than 12 years' experience with steel structure manufacturing and steel building projects running. During the past 12 years we have done many steel structure projects both at home and abroad. Now our projects stand in more than 20 countries around the world. More than 200 well-trained workers running the 6 steel structure production lines all year round to ensure the project finished on time. All equipment is up to standard and all the facilities are maintained periodically by professional technicians. Our products almost include all kinds of steel structure buildings, such as light steel workshops and warehouses, heavy industrial steel structure buildings, steel commercial buildings, prefab houses, container houses, steel structure aircraft hangars, Space frame and pipe truss roofs, and mining belt conveyor galleries. We have more than 20 experienced engineers who are familiar with the structure design and management procedures of all steel structure projects. There is a high-qualified, high-efficiency and professional technical team ready to find best solutions for you at any time. Every one of our marketing managers is well trained and willing to provide best services. And we have a strict standard for finished products testing, to ensure the quality of all our steel structures. Meanwhile we have also passed the ISO 9001 quality management system certificates. 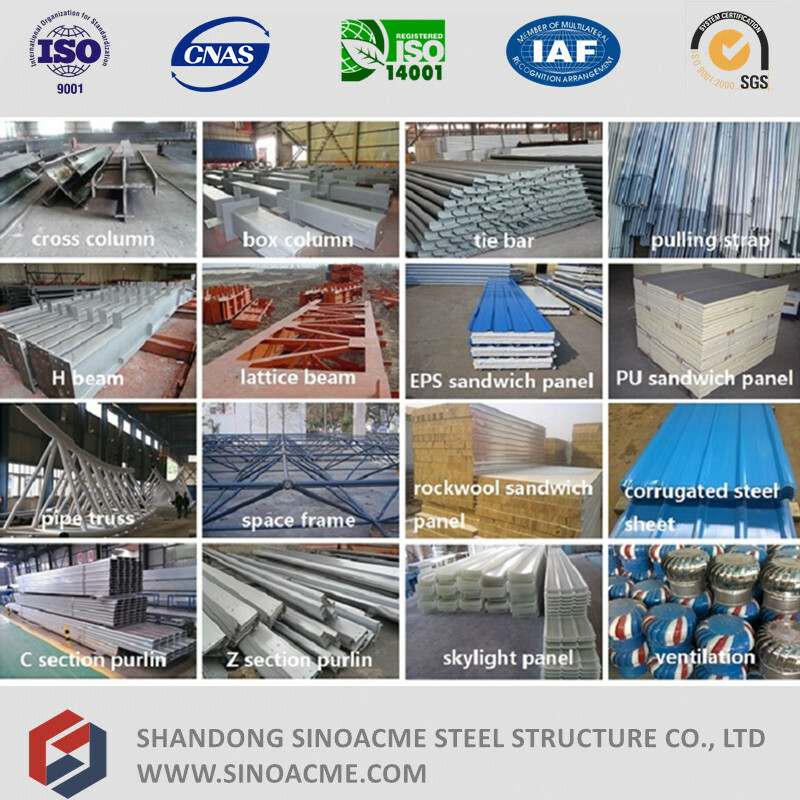 Why choose Sinoacme Steel Structure Co., Ltd? 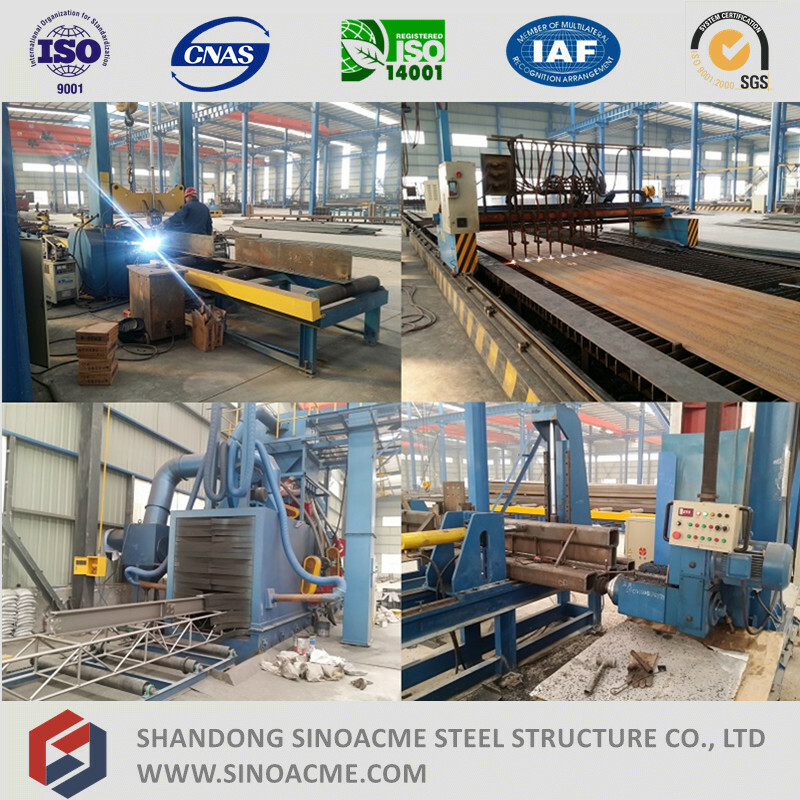 Shandong Sinoacme Steel Structure Co., LTD established in the year 2004, located in Shandong - one of the developed province in China. 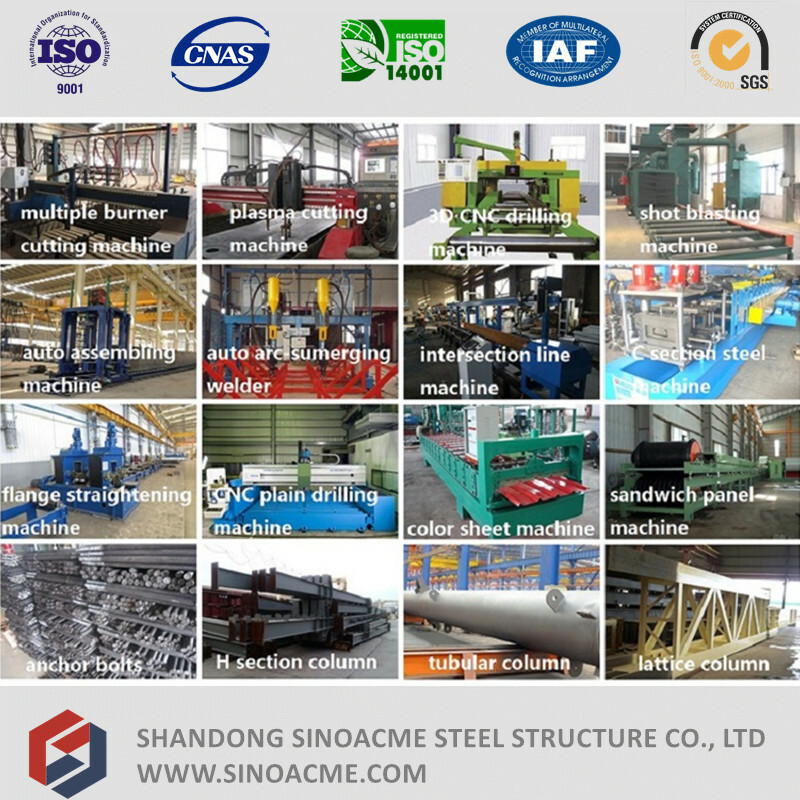 After 11 years sustainable development, Sinoacme has become one large modern enterprise which specializing in the designing, fabrication, exporting and engineering installation on varied kinds of steel structure projects. 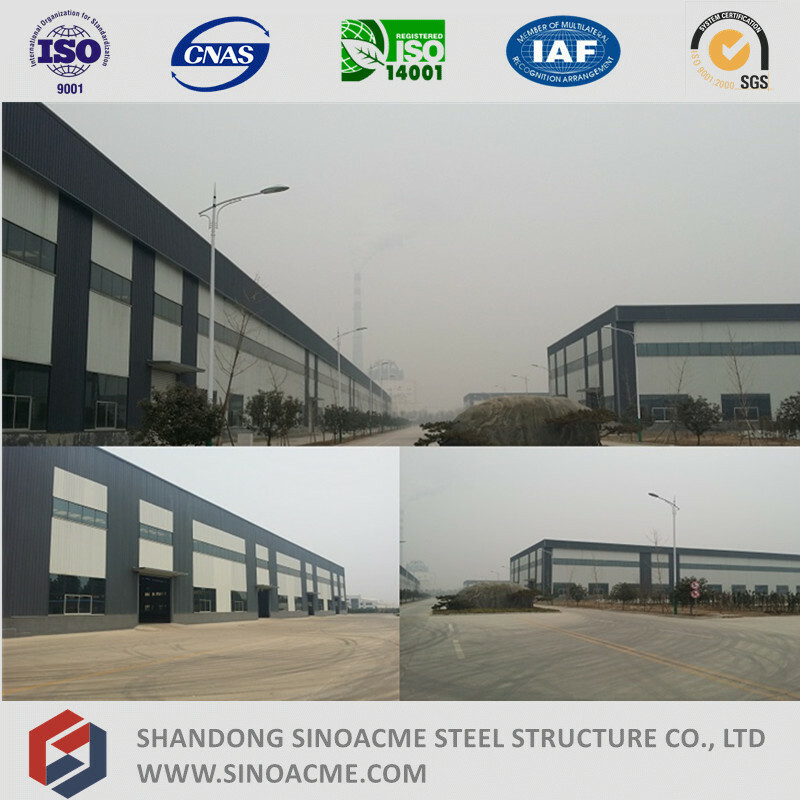 Sinoacme has around 130,000 square meters plant area with 6 advanced production lines for steel fabrication. 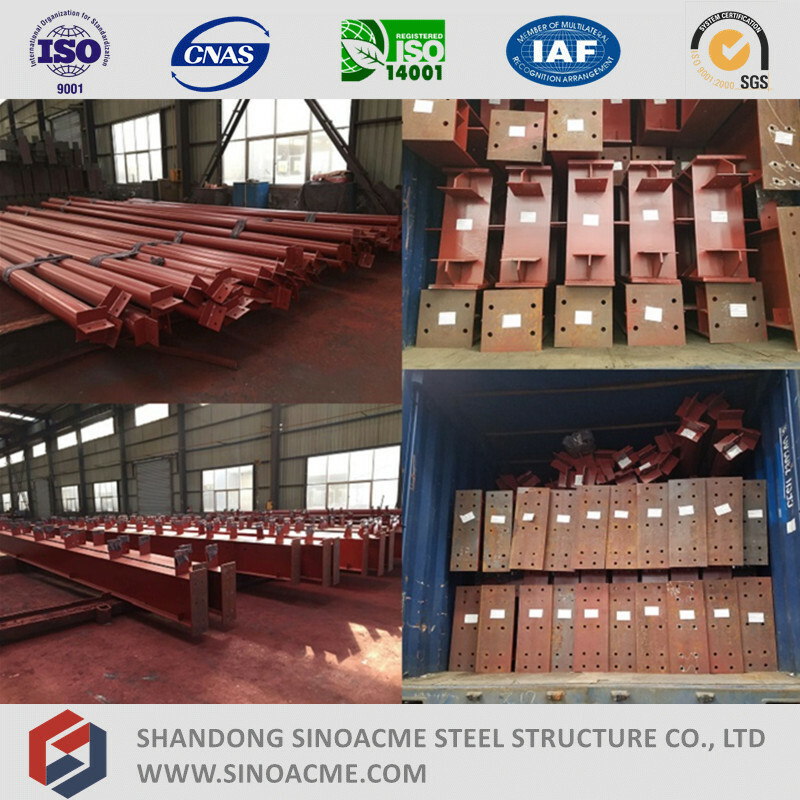 Different kind of structural steel parts like welded H beams (columns), cross shaped columns, lattice beams (columns), box columns, C section purlin, Z section purlin, steel pipe parts, special shaped components etc. are produced by more than 200 experienced workers with an annual production capacity of 70,000 metric tons. Sinoacme also has a professional technical team of more than 40 experienced engineers who are familiar with the architectural design, structural design, governments' codes, etc. for overseas markets. Sinoacme's technical team can help to design the structures of light steel gabled frames, commercial buildings, industrial platforms, pipe truss & space frames, petroleum pipe galleries and trestle structure for coal conveyors. Sinoacme has acquired the ISO9001 quality management system certificate and ISO14001 environmental management system certificate. With inherent honesty and the goal of create one international well-known brand, Sinoacme has attracted customers from all over the world and our products have been shipped to more than 40 countries in Northern Asia, Middle East, Africa, Australia and Latin America. Steel Structure Building, steel structure construction, steel structure fabrication, steel structure warehouse, steel structure workshop, poultry house, broiler house, aircraft hangar, pipe truss, space frame, conveyor steel structure, commercial building, industrial building, prefab house, container house, prefabricated building, steel building, Steel Workshop, steel structure workshop, Steel Warehouse, steel structure warehouse, pre-engineered steel structures, pre-engineered steel building pre-engineering steel structures, steel structure aviation center, steel structure plant, steel structure factory, steel structure shed, steel structure shelter, Metal Frame, steel frame, metal structure, portal frame, gabled frame, shell frame, steel structure garage, steel structure car parking building, steel structure shopping center, steel structure arc roofing system, prefabricated steel structure, prefabricated steel building, steel structure stand shed, metal frame plant, steel frame plant, steel frame building, steel frame shed, steel frame sheltermodular house, prefab house, prefabricated house, metal frame shed, steel structure carport, marine structure, pre-engineered building, pre-engineering building, offshore steel structure, drilling platform. Contact us if you need more details on Steel Structure Warehouse. 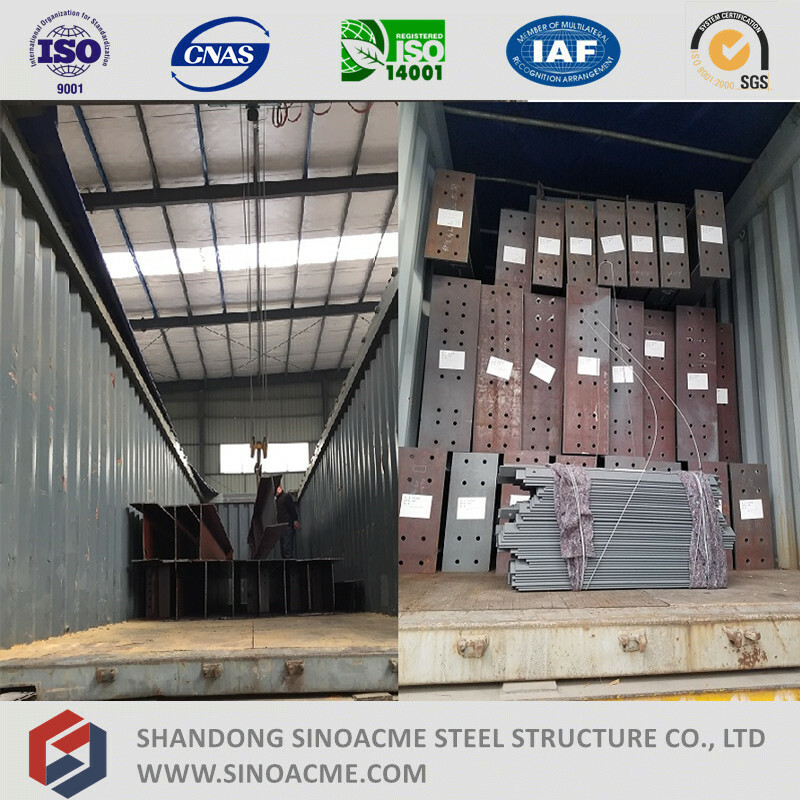 We are ready to answer your questions on packaging, logistics, certification or any other aspects about Steel Warehouse、Steel Building. If these products fail to match your need, please contact us and we would like to provide relevant information. Copyright © 2019 www.china-steel-structure.com All rights reserved.